Empress Suiko (推古天皇, Suiko-tennō) (554 – 15 April 628) was the 33rd monarch of Japan, according to the traditional order of succession. Suiko reigned from 593 until her death in 628. Before her ascension to the Chrysanthemum Throne, her personal name (her imina) was Mikekashiya-hime-no-mikoto, also called Toyomike Kashikiya hime no Mikoto. After Bidatsu's death, Suiko's brother, Emperor Yōmei, came to power for about two years before dying of illness. Upon Yōmei's death, another power struggle arose between the Soga clan and the Mononobe clan, with the Sogas supporting Prince Hatsusebe and the Mononobes supporting Prince Anahobe. The Sogas prevailed once again and Prince Hatsusebe acceded to the throne as Emperor Sushun in 587. 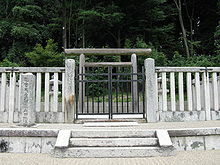 However, Sushun began to resent the power of Soga no Umako, the head of the Soga clan, and Umako, perhaps out of fear that Sushun might strike first, had him assassinated by Yamatoaya no Ataikoma (東漢直駒) in 592. When asked to accede to the throne to fill the power vacuum that subsequently developed, Suiko became the first of what would be several examples in Japanese history where a woman was chosen to accede to the throne to avert a power struggle. 593 : In the 2nd year of Sushun-tennō 's reign (崇峻天皇二年), he died; and contemporary scholars then construed that the succession (senso) was received by the consort of former Emperor Bidatsu. Shortly thereafter, Empress Suiko is said to have ascended to the throne (sokui). In 599, an earthquake destroyed buildings throughout Yamato Province in what is now Nara Prefecture. The adoption of the Sexagenary cycle calendar (Jikkan Jūnishi) in Japan is attributed to Empress Suiko in 604. Empress Suiko ruled for 35 years. Although there were seven other reigning empresses, their successors were most often selected from amongst the males of the paternal Imperial bloodline, which is why some conservative scholars argue that the women's reigns were temporary and that male-only succession tradition must be maintained in the 21st century. Empress Genmei, who was followed on the throne by her daughter, Empress Genshō, remains the sole exception to this conventional argument. The Imperial Household Agency designates this location as Suiko's mausoleum. It's formally named Shinaga no Yamada no misasagi. This page is based on the Wikipedia article Empress Suiko; it is used under the Creative Commons Attribution-ShareAlike 3.0 Unported License (CC-BY-SA). You may redistribute it, verbatim or modified, providing that you comply with the terms of the CC-BY-SA.